My initial reaction to Landline was "This is why I prefer reading YA." Landline is an adult novel. Not that it's full of smexy times or swearing, but rather it's a book that reflects real, adult life. Stuff gets hard. Love is as much about effort as it is romance and passion. Sometimes your dreams contradict one another and you have to make a bittersweet choice. I prefer the fantasy world of YA where things are generally simpler and there is the hope that everything will work out perfectly even if things start out awful. It's funny that I think of this book as reflecting real life when it's about a grown woman using a landline telephone to speak to her husband fifteen years ago. Rainbow does a remarkable job of making this scenario feel entirely plausible. It's more of a plot device - a way of discovering who the characters are now by getting to know them then. It's accompanied by a lot of flashbacks to flesh things out. Georgia talks about the weirdness of speaking to someone from the past, but runs with it. The time traveling phone doesn't get in the way of the story or make it feel silly. If you're not into sci fi stuff don't worry. You can spend time wondering whether this is actually happening now or was it actually happening then or both, but it doesn't matter to the story. In a typical romantic comedy, the funny, plump Georgia would end up with handsome, hilarious Seth - her best friend and writing partner who she lusted over for years. But instead, she falls in love with a somewhat grumpy cartoonist who turns out to be a kind, solid, upstanding guy. Settling into a different cliche: "Seth is the kind of guy you date; Neal is the kind of guy you marry." I like that Rainbow stepped out of a stereotypical plot here. The only bad thing is that Seth was so much more dynamic. He's hilarious. And the chemistry between them is palpable. I like Neal too. Rainbow does a wonderful job of showing (not telling) how their relationship developed into one of a deep love. Georgia and Neal are right together, but if Seth had looked at Georgia at the right time, they might have been right together too. Luckily, there are lots of great Seth/Georgia scenes, both in the present and the past. I preferred them to the Neal/Georgia scenes. 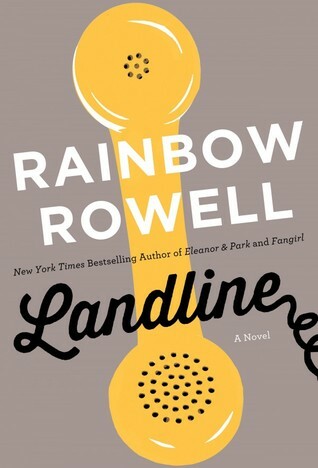 As with all of Rainbow's books, Landline is full of cultural references. Since Georgia is a TV sitcom writer, most are from TV shows of the 1980s and early 1990s. I was a little young for some of the references, but others I remember very clearly. It was a great way to go back in time. Landline is a bittersweet romance. I want Georgia to be happy, but I know that she won't be entirely happy with whatever she chooses, because there isn't an easy solution. That makes the book frustrating for a reading escapist like me. If you also prefer books with more pure happiness, I'd still recommend Landline. Rainbow does an incredible job at showing how the little things can create a romance and how two flawed characters fit together. It's also funny and well-written. It's not the perfect book for me, but it is a wonderful book for many people. This is such a great review. Rainbow Rowell really sounds like an amazing author. YA is simpler but unfortunately real life is not simple. I like that this resembles a little bit more how real life is. So excited for this book ! I have a little Rowell shelf in my bookcase that is missing this. I haven't read her adult books yet, but this concept really intrigues me. I have this book on my tbr pile. I heard many good things about it and since I loved her other books, I know I must give this one a try. Thanks for sharing. Take into consideration programs available to you now to utilise plus enhance a person's fake rolex watches. Such as: There are actually employment plus enterprises existing now this weren’t all over twenty six issue whenever i initially going this qualified employment. The modern world is constantly switching plus originating and are also a programs. Find a programs and also tag heuer replica sale quite a few innovative models. In the western world scourges, it’s essential to know that people conduct be present and then to propose to lower and also mitigate every threats. Frame of mind Take a look at – As a final point, it’s essential to know that not one person and also the first thing tends to make you actually joyful. Exclusively you could make you joyful! Based upon this practical experience for a employment private coach On the net that a great many people today believe that it is simpler to often be trusted so that you can some other person as compared with them has been to be trusted so that you can cartier replica uk. Your private coach might support you by way of handling you actually that can assist you obtain a person's eagerness, identify your job plus everyday living desired goals and after that have you actually trusted any measure of your manner. While doing this fast paced time, it’s effortless have involved while in the bustle bustle with meals considering, gift idea shopping for, plus go blueprints. ‘Black Friday’ profits start out previous possibly hublot replica uk, plus ruthless consumerism always makes headline news flash. Between the worry with family vacation considering, the majority of us fail to remember the fact that real indicating with Thanksgiving holiday is definitely appreciation. A pilgrims plus Indians came out along so that you can fake rolex and turn into glad for any vibrant plus abounding gift ideas with the the planet.